Trying to imagine the future is a commonly shared human experience. Whether we try to figure out who will win the football game, what this next year will bring, or what we will learn from an internship, we are constantly thinking of what possible outcomes will occur. We fill ourselves with predictions and expectations for every moment of life. It is extremely difficult to go into a situation without expectations. While thinking ahead is not necessarily a bad practice, I learned that expectations can limit us and our outcomes. During my internship at Bethesda Mission in the Development department, I experienced God exceed and shatter my expectations. Ephesians 3:20-21 says, “Now to him who is able to do immeasurably more than all we ask or imagine, according to his power that is at work within us, to him be glory in the church and in Christ Jesus throughout all generations, for ever and ever! Amen” I realized that I was limiting God’s power when I set my own expectations because he can do immeasurably more than all I could ask or imagine. While at Bethesda, I saw God do immeasurably more in building relationships, restoring lives, and sparking personal growth. Knowing my internship would be three months long, I did not expect to develop many relationships in that time. I was at the office two days a week and imagined I would be treated as temporary help. This expectation proved to be wrong even on the first day. From the start, I was welcomed at the office. I had my own tasks as an intern but that did not stop staff members from interacting with me and showing interest in my life. Working alongside caring professionals, I learned in an environment that allowed me to ask questions, try new things, and learn from the best in the field. I built priceless relationships with Christ followers who are committed to carrying out God’s redemptive work in the world. Listening to people’s stories was one of the most influential parts of my internship. God’s hand at work was clearly evident in each testimony. The annual banquet was a beautiful example of lives restored by Christ. I did some of the behind the scenes planning for the banquet during my internship but was not prepared for splendor of such an event. Over six hundred people gathered to celebrate the lives being restored at Bethesda, and it was evident that God was working in unpredictable ways. Each person has their own unique journey and I enjoyed the opportunity to hear just glimpses of their journey towards restoration. God is doing immeasurably more in the lives of Bethesda’s guests. As traveled to different ministry locations, I met people on the road to God’s full restoration. I also witnessed Christ restoring lives in the staff members at Bethesda. For a few articles, I had the pleasure of interviewing Bethesda staff. I was blown away by how God uses the ministry of Bethesda to restore the lives of staff. Working at Bethesda, I saw the true joy of serving for a higher purpose. It is common for interns to receive grunt work that no one else wants to do. I was expecting this would be the case at Bethesda as well. Again, God shattered my expectations and I was given responsibility and professional experience beyond what I imagined in the beginning. I could make the internship my own. I worked with Katie Andreano, manager of communications, who constantly asked me what I would like to learn about. She walked with me as I developed my professional writing skills. With her guidance, I wrote appeal letters, newsletter articles, social media posts, grant requests, and now, blog posts. She let me try a little bit of everything which allowed me to grow and develop a portfolio I can use going forward. I also grew in my knowledge of nonprofit organizations. As an intern I saw the ins and outs of a well organized ministry which is knowledge I will use as I look to pursue a career in the nonprofit sector. For anyone who is considering working with Bethesda Mission, no matter if that is through donating, interning, or volunteering, get ready to see God do immeasurably more than all you could ask or imagine. You can try to have expectations, but from my experience I can tell you they will be exceeded. 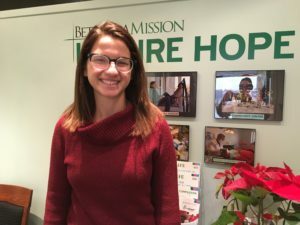 Bethesda Mission currently has internship opportunities available for summer and fall 2019. Please contact Katie Andreano at kandreano@bethesdamission.org to find out more information.